Light + Love : Sweet Like Chocolate. The sweetest greetings have been sent my way. Friends posted greetings in facebook and twitter. Some others wrote me long emails. Many others texted. Some, called. Funny how I have friends who actually greet me everyday for nine days (novena? LOL). And there are those who text me everyday for one week. But I like it. I feel so loved. My birthday is still tomorrow, but the celebration has started. And perhaps, will go on for a few more days or weeks. Thank you sweet sweet people for the kind thoughts and wishes. Two Aileens made me feel very special. Ayen called last night. I have been thinking about her and Nikki for weeks now and her call was a pleasant surprise. It was so wonderful to hear her voice. We haven't been in touch for many months because life got too busy. But it felt like we never really lost touch. In fact, hearing her voice was such great comfort. It felt like home. Thank you, Ayen. I was soooo happy. And another Aileen wrote a heartwarming entry for me. She's one of the most talented people I know. And one of the gentlest, too. I hope one day we'd be able to spend more time together. Thank you, Leen. I had to hold back tears while reading it. Yes, I have the sweetest sweetest friends. I'm off to dive this weekend. I will bring photos and stories when I get back. 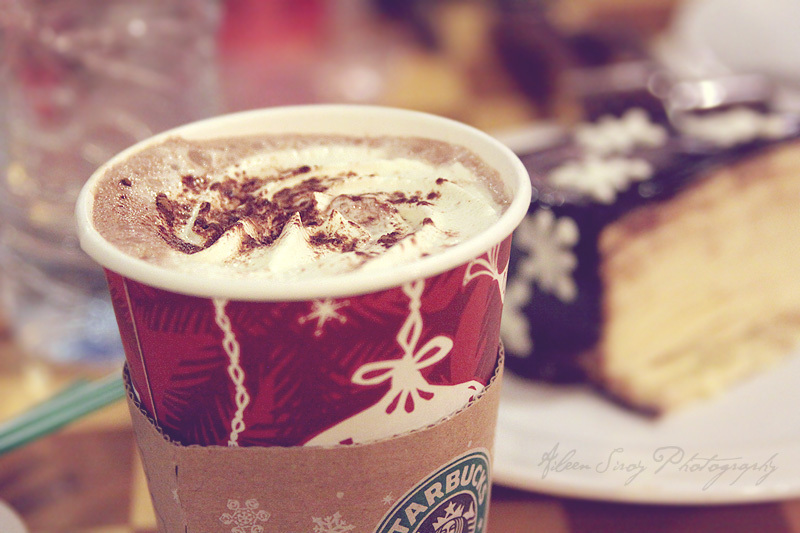 Photo: My fave hot choco from Starbucks. Have a wonderful birthday, Ai! You deserve all the happiness and the wonderful things that this beautiful universe can offer. I think you have the sweetest friends because you treat them the same way. I will await your diving photos and stories! Allow me to be one of the many who are blessed to know you, to greet you happy, happy birthday. You're a good person, Ai and you deserve the sweetest friends in the world. Sweet friends are one of life's best treats, one whom doctors will never prescribe you to stay away from :D Enjoy your dose of sweetness from family and friends on your birthday and forever. happy bday ai! did you receive my text? Thank you, Liz! And thank you for all your inspiration.